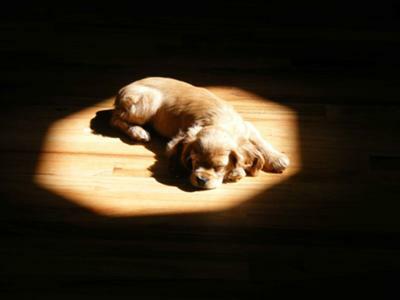 I can always find the spotlight! After our beloved Moose died this summer we had to have another cocker spaniel. We knew we could never replace him so we chose a little girl in a different colour. 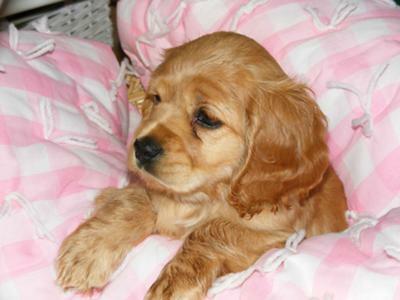 This is Rosie she was born April 1, 2011, and is a wonderful playful cuddly bundle of fun. She loves children, dogs, cats, big people and playing ball is her favourite game. She has had a couple of problems with her ears from swimming in the lake but we resolved that with an ear dry solution from our vet. She is still prone to nibbling toes fingers and noses but hadn't chewed around the house at all. We take her wherever we go, she travels well in the car and the RV. She rarely barks and is just a pleasure to be with. Unlike our previous dog, she doesn't chase cars! Thank goodness for that! I'm so pleased she doesn't chase cars - so many dogs do! Unfortunately, many dogs do chase cars as it's in their nature - 'prey' runs and they chase it - they simply see the car as prey. Rosie is so beautiful - I'm sure you'll enjoy her lots. What a lovely little cocker spaniel Rosie is - she is delightful. I especially love the photo of Rosie lying in the sunshine. I'm also very sorry for your loss of Moose - I've never lost a dog and I hope not to for a very long time yet. RIP Moose! My Marley was born april 16 2011 and looks very similar! We lost our Jasmine 2 weeks ago. She had cancer. My husband brought her back from Germany 14 years ago...she was the best dog in the world. We knew that after she passed we wanted an addition to the family - like you said not to replace her. I read your previous submission about Moose and it was so sad. You're right, you won't ever replace him but I'm sure you'll never forget him either. You're so lucky to have Rosie - she is just the little princess!